Tips to Make Vacuuming More Effective: 1. Use a HEPA filter or bag if possible to contain the fine particles. Empty the bag or canister when it’s 2/3 full. 2. Vacuum in multiple directions to loosen the dirt and soil. 3. Don't rush! More debris is removed from the carpet when you pull back on the vacuum, not when you push forward. 4. Check to make sure your vacuum is working properly. Check the belt and brush bars, removing hair as necessary. 5. Do it often! Carpet does a great job at collecting and capturing dirt. It’s important to remove the dirt and debris regularly. If you’re in need of a deeper cleaning, call us at 805-544-4761. We can help! 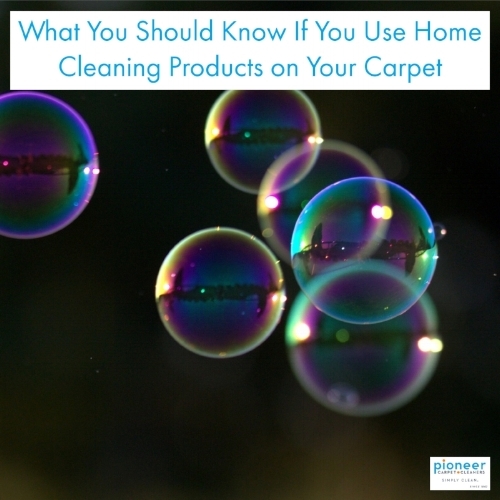 Have you ever used a home carpet cleaning product and notice your carpet seemed to get re-soiled quickly? Soaps can be responsible for this as they cause rapid re-soiling if not rinsed well from the carpet. If you’ve ever spilled a lot of soap in your sink, you know how long it takes to rinse all the soap out and how much water you had to use in order to do that. Soap in your carpet isn’t easy to remove and you can’t just dump loads of water on it without creating another problem. Do-it-yourself and other home carpet cleaning machines don’t have a strong enough suction to remove it either. In these cases you’ll likely be in need of a professional carpet cleaning utilizing hot water extraction to thoroughly rinse the carpet and remove all the soap and whatever else was applied to it. If you’re in need of a cleaning, let us know. We can help!